An artist is often associated with someone who has the talent or skills to create something. To dream of an artist is related to our creativity, our talents, our skills, and our ability to manifest our desires. It can also be a symbol of our ability to express our emotions and creativity. Artwork often gives us a clue into what we are trying to create for ourselves in our lives. Think about the current progress of the artwork: Is it just beginning? Almost finished? A complete masterpiece? Your feelings about the overall art piece or painting will also show you some important insight into what emotions and what current life events are present. In order to fully understand what your dream about art or being an artist might be about, it is very important to think about what you personally associate with art. Do you love art in waking life? Do you feel creative in your day to day activities? 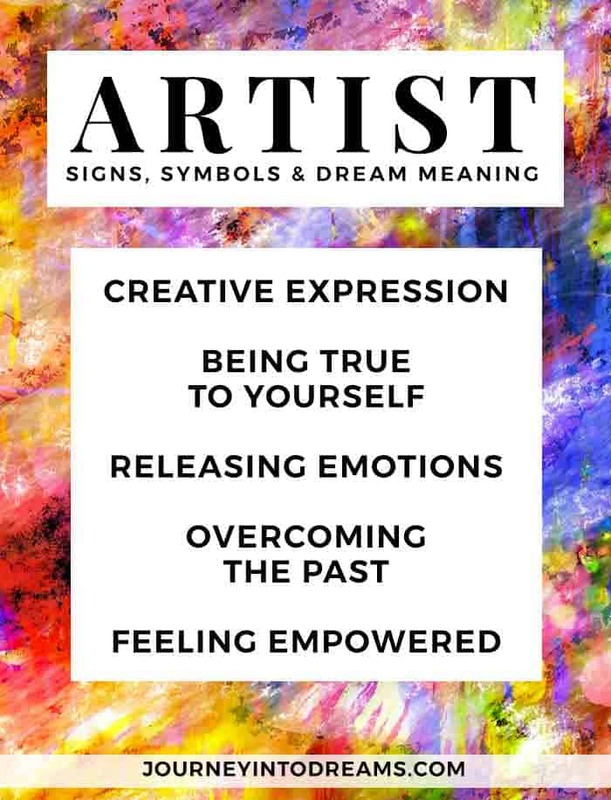 Here are some of the things an artist might mean to you. Art is a form of creativity. When you create something, you are expressing yourself. This may be your thoughts, ideas, or emotions. If you are making art, it can be a sign that you want to express something to others, but need to do so in a creative way. For many people, art is therapeutic. It is a good way to release emotions and feelings. Do you have a longing to let go of pent up feelings and frustration? If you are creating art in a dream, you may have a desire to let go and heal from different feelings and emotions. You may also be ready to finally overcome problems from the past. Artists have full power to create anything they might like to! Dreaming of making art can mean you are feeling empowered. This type of dream could be reminding you that you have the ability to create the life you want. If you are an artist in your dream, this could be a way of showing you that you have the ability to create your life exactly the way you want it. You are the ultimate creator, and it could mean you need to release any past emotions or feelings that are holding you back from living out the life you truly desire. The picture which you paint in your dream may be symbolic of the way you currently experience events and emotions in your everyday life. Another possible meaning is that you are in need of a way to express your thoughts, ideas, and emotions. You may be bottling up thoughts and emotions inside, and it's time to get them out in the open. If you are already an artist in your everyday life, dreaming of art could symbolize that you are focused on work. Is there a healthy balance between fun and work? Are you feeling creative and empowered as an artist, are have you been feeling frustrated lately? If you dream about the work of a famous artist or that you meet a world renowned artist, begin by asking yourself how you feel about this artist's work. Is there something that stands out about his or her artwork? This may be a clue into what aspects of your life that may need your focus and attention at the present moment. For example, if you are dreaming of Van Gogh and a starry starry sky, this could be a symbol it is time to "reach for the stars" for some people, though if you don't like his artwork then it could mean that there is something holding you back from being able to see the infinite possibilities available for you to create in this world. Dreaming of someone who paints portraits of people could mean that you need to focus on creating better relationships with others. If the artist is unknown to you, then this could show that you are currently working on a project - that you haven't quite reached your goals or ambitions. The subject of the artwork will often provide more clues and insight into what aspects of this project may be necessary to focus on. This unknown artist may show you that there are others out there who can help you with expressing yourself or with meeting your goals to create the life you've always imagined. If you dream of an artist who is unable to sell paintings or isn't making any income from their work, it could show that you need to better understand the way you are using your skills, and to let go of any emotions that are holding you back from achieving success. If you are dreaming of different types of art in your dream, this could also signify something important. 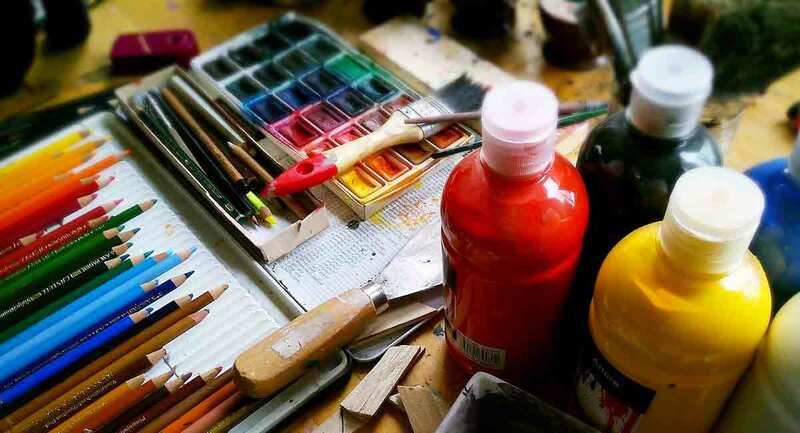 If you are dreaming of paints and different painting styles, this is very different than dreaming of sculptures or dreaming about a pottery wheel. Dreaming of paint can symbolize that you are trying to cover something up, or that you are looking for a means to express your true feelings. Painting can be an indication of needing a way to express yourself or communicate ideas to others creatively. The types of paint can also be a clue. If it is watercolor, it is likely your painting is a sign or symbol of needing to express emotion, since water is often a sign of emotions. What you are painting can also have some significance. For example, if you are painting a bear, it would be helpful to understand the meaning of bears in your dream or your own personal associations in life. If you are painting something abstract, it could mean you are trying to find a different approach in understanding a situation in your life. Dreaming of sculpture can be a symbol of shaping things in your life. You may be trying to create a new situation in your life. A sculpture can also be a sign that you are trying to change someone or something. Ceramics and pottery may also have additional meaning, depending on what the item might be. For example, if you are creating dishes, it is helpful to understand that dishes are seen as having a use and purpose. Are you trying to create or find your purpose in life? Looking at art in a museum or gallery can also have some significance for the meaning of the dream. A museum is a collection. Is there something you are collecting? Perhaps you are collecting too many thoughts and ideas, and it is important to find a way to process and organize all of these things. A wall of art could mean you are potentially hiding something - what is blocking you? What are you not seeing? Are you looking at only one aspect of the whole? Art as a symbol and sign in our life can be very helpful to understand. We see art almost every day in our waking lives, so it is helpful to know what it can mean for us. Have any dream interpretations or experiences of dreaming about an artist you would like to share? Tell us about them in the comments below!